The Durango & Silverton Narrow Gauge Railroad is one of the world’s most famous and picturesque heritage railway experiences. The Denver & Rio Grande Railway constructed the 45-mile Silverton branch in just 11 months using mostly hand labor, to serve the gold and silver mines in the area. 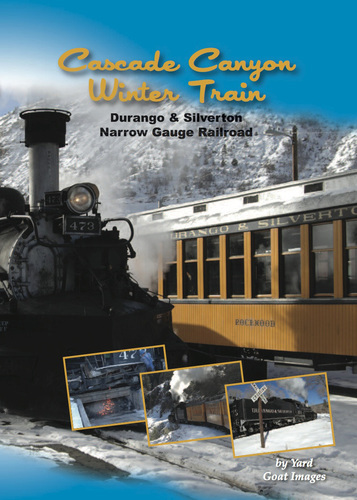 In 1981 the railroad sold the Silverton branch, which became today’s Durango & Silverton Narrow Gauge Railroad. During the warmer months of the year, the Durango & Silverton runs multiple trains each day on its world-famous railroad featuring breathtaking trips between Durango and Silverton. Less well known is the Cascade Canyon Winter Train, operated from late November to early May. The journey begins at the historic Durango depot where travelers board the train which takes them about halfway to Silverton. The trip includes the spectacular “High Line” built on a rocky ledge towering above the Animas River. The train is turned on the wye at picturesque Cascade Canyon, where passengers may get off to enjoy a picnic, explore, or warm themselves by a fire. A wonderful way to enjoy wintertime Colorado in the mountains! Our 83 minute DVD “Cascade Canyon Winter Train” was captured over three sunny January days just after a fresh blanket of snow brightened the scenery. Our videography team captured the trips onboard the train, from trackside, plus exciting pacing scenes. We also include behind-the-scenes views not available to the public, showing the locomotive being serviced, dumping the fire, and turned on the historic turntable, plus a rare look inside the modern machine shop and a tour of the huge roundhouse and museum.